Convert Scanned Image files and PDF files to editable Word documents. mini JPEG to Text OCR Converter does convert scanned image files, scanned PDF files and text based PDF files to editable Word documents, it is also offer powerful scanning features, it can scan multiple pages into one or more Word documents. OCR (optical character recognition) creates text from your documents. mini JPEG to Text OCR Converter software doesn't require with Adobe Acrobat, and Microsoft Office. That means this program doesn't need third party's program support. You can do conversion without Adobe Acrobat and MS office. mini JPEG to Text OCR Converter is a solid converter to convert scanned documents (include scanned PDF files and Image files) and normal PDF files to MS Word (DOC and RTF) documents readable/editable by Microsoft office. During conversion, all page contents (including text, image, table, graphics etc.) are export to editable word documents. Moreover, the output Word documents will keep the same quality with the original documents, you can edit the created Word documents easily. Why Choose mini JPEG to Text OCR Converter? mini JPEG to Text OCR Converter is an easy to use OCR application for creating editable and searchable files from scanned documents, PDF files and digital camera images. The one-click conversion feature instantly turns paper documents into editable MS Word documents. For users working with documents that are paper based and need to be scanned or, have already been saved as image PDFs, mini JPEG to Text OCR Converter is the choice. Able to convert scanned PDF files, scanned Image files and non-scanned PDF files to editable Word documents. Convert PDF to Word and preserve the original layout of your PDF in an editable Word document. Several PDF to Word conversion options are available. Convert PDF to Rich Text Format (RTF) or Word Format, the PDF to RTF feature allows users to convert large PDF documents faster than the PDF to Word option. The PDF to Word conversion is processed at a very high speed. Convert entire document or only a specific page range. JPEG to Text OCR Converter supports most Windows and Office platforms - 98/ME/NT/2000/XP/2003/Vista/7, both 32bit and 64bit systems. Convert PDF files into Microsoft Word and RTF formats. Support conversion from encrypted PDF files and password protected documents. Convert PDF documents to word formats, Fast, Accurate, Free Trial. 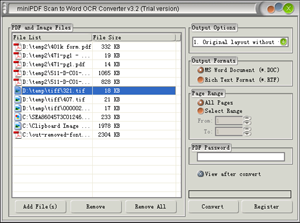 Batch conversion of multiple PDF documents to word files. Support drag and drop of files. Create full layout Word document and text only Word document. Character recognition accuracy is more than 98% in the OCR engine. Page layout reconstruction accuracy is good enough. OCR engine is support English, French, German, Italian, Spanish, Portuguese languages. miniPDF Document Imaging (Scan and Edit Documents) application includes lots of powerful image editing and scanning features. miniPDF Document Imaging (Scan and Edit Documents) application is a universal user-interactive a scanning software program compatible with TWAIN compliant scanners. The scanned images are displayed and can be saved as a single or multipage TIFF file or in many other common graphics formats, including JPEG, GIF, PNG, and BMP, etc. miniPDF Document Imaging is a perfect companion to our JPEG to Text OCR Converter software. Extensive processing functions such as Mirror, Flip, Rotate, Resample, Skew, Crop, Dither, etc. Copyright © 2002- miniPDF.com Company. All Rights Reserved.